Saudi Arabian oil industry winning war against U.S. In 2014, the Saudi Arabian oil industry announced a war against its U.S. counterpart following the Saudi-Iran feud on oil prices. In the past, it has been common that Saudi Arabia have attempted to stabilise oil prices by increasing supply when prices went up and decreasing supply when prices were down. This practice occurred prior to the U.S. hydraulic fracturing revolution which saw a rapid increase in U.S. oil production, resulting in them taking over a large portion of the Saudi share of the oil market and lowering prices. Trillions of dollars in investment and millions of new jobs in America were created as a result of this influx in oil production, however, Saudi Arabia increased their production hoping to chase out U.S. oil companies by flooding the market. At first, this Saudi strategy seemed somewhat successful, with the flood of crude oil driving down prices and U.S. companies minimising their drilling. 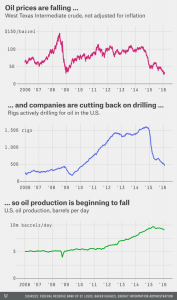 What the Saudi’s didn’t anticipate however, was that the wells U.S. producers were still drilling were so successful that their overall production barely moved even despite cutbacks. When the prices rebounded slightly, U.S. oil companies went back to their initial production levels and began to push prices down. The following image from the Federal Reserve Bank of St Louis gives an indication of the amount of oil produced by the U.S. during drilling cut backs, and then the brief period of growth following. In recent months, there have been developments in the oil industry which suggest that the Saudi Arabian oil strategy may be working. Research company IHS notes that 60 oil companies in the U.S. have already filed for bankruptcy with an estimated 150 companies expected to do the same. The large oil companies in the U.S. have only survived the low prices of oil as long as they have because of the billions lent to them by large banks and investors, who lent the money anticipating the price falls would be short-lived. Given the longevity of the price lows at the moment, as well as global economic uncertainty following the Greek financial crisis and China’s economic slowdown, investors and banks are more cautious about their lending, especially given that 60 of the leading oil and gas companies in the U.S. have accumulated up to US$200 billion in debt. It also doesn’t help the U.S. oil companies that the Federal Reserve System have decided to increase interest rates. With all these factors coming into play, American oil companies are cutting their production, with the Energy Information Administration commenting that approximately 600,000 less barrels per day have been produced since April last year, and this is expected to double by the end of the year. The increase in U.S. oil production on top of the Saudi increase caused prices to drop below US$80 a barrel as seen on the below graph by Atlas. Analysts have also anticipated that US$380 billion in oil and natural gas field investment has been put on hold by companies with 250,000 workers having lost their jobs globally in the last year as a result of this. 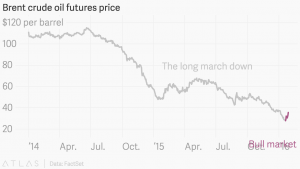 If the U.S. is decreasing its oil supply, it may be expected that the price of oil will go back up, however, this will take a number of years. What it does mean is that through producing oil at close to maximum capacity, Saudi Arabia are winning the oil war against the U.S.